In Part II of my “Perspectives on Solar Energy” blog series, I discussed the U.S. Department of Energy (DOE) SunShot Initiative’s support for increasing the efficiency of solar energy technology. 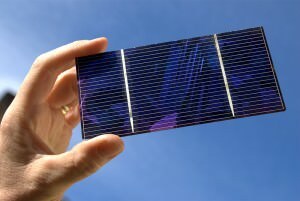 On February 12, DOE announced that the U.S. solar industry is more than 60 percent of the way toward achieving one of SunShot’s most important goals—making the cost of solar energy via utility-scale photovoltaic (PV) systems fully competitive with traditional energy sources by 2020—only three years into this decade-long program. What a remarkable achievement! The above chart from DOE illustrates this significant reduction in the price of electricity produced by utility-scale PV systems. 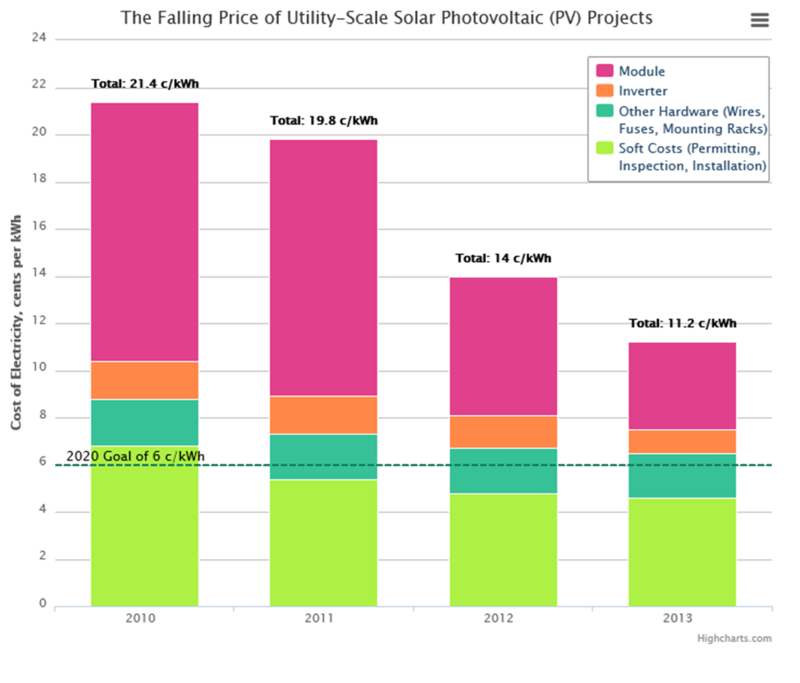 In the United States, the estimated levelized cost of electricity (LCOE)** from a utility-scale PV project has dropped from about $0.21 per kilowatt-hour in 2010 to $0.11 per kilowatt-hour at the end of 2013, well on the way to achieving SunShot’s target of $0.06 per kilowatt-hour. The chart also details more specific cost reductions, such as a two-thirds decrease in the price of modules and more modest reductions in costs related to hardware, permitting, installation, and inspection. Additional reductions in the cost of PV systems will be achieved through the and from widespread deployment of larger PV systems. 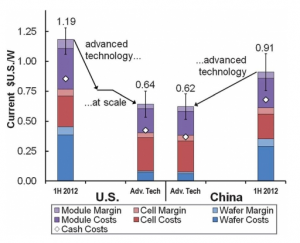 The figure below from a DOE Office of Energy Efficiency & Renewable Energy Cost Analysis projects the future cost of electricity from U.S.-manufactured advanced photovoltaic cells and modules used in larger systems. The cost projection shows comparable costs to modules imported from China. More information is available in an analysis conducted by the National Renewable Energy Laboratory (NREL) in 2011. The ultimate SunShot Initiative Goal for PV module costs is $0.50/watt, and a module efficiency of 20%. There are many game-changing photovoltaic development projects, which are underway that have the potential to help achieve SunShot goals of lower cost and higher efficiency modules and systems. On March 4th, 2015, the Department of Energy’s Solar Energy Technologies Office will conduct a webinar on projects in the Sunshot Initiative Incubator portfolio. The webinar will showcase products and solutions that are currently being devloped by awardees. It will be an opportunity to learn about approaches that are being developed to address the growing need for sustainable sources of energy for generating electricity. Watch this blog space for future comments on Perspectives on Solar Energy! ** Note: Reductions in the cost of electricity are based on estimates of the levelized cost of electricity (LCOE). The LCOE is a measure of the national average of electricity cost based on certain assumptions regarding financing costs and generation availability projected over the life of a generating asset. The LCOE model provides a benchmark for measuring relative changes in electricity costs.